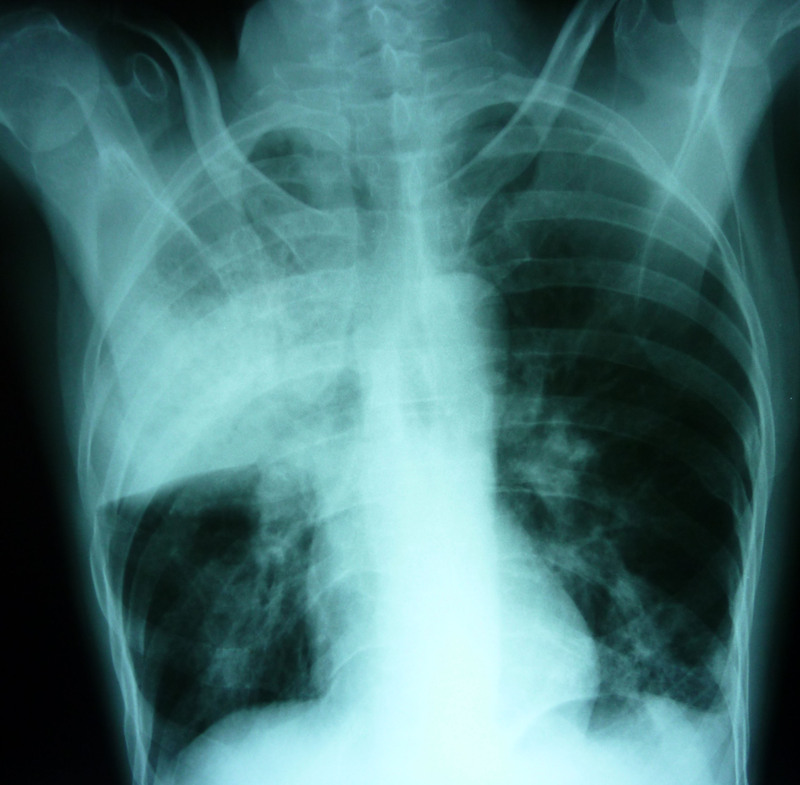 TUBERCULOSIS IS ONE OF THE WORLD’S top infectious diseases, second only to AIDS. The numbers are staggering: One-third of the world—two billion—is infected and nearly nine million become infected each year; each year more than 1.6 million die. The World Health Organization estimates that one actively contagious person infects 10 to 15 people a year. Tuberculosis (TB) is an air-borne, infectious bacterial disease transmitted by bacilli when an infected person talks, sneezes, or coughs. It decays the lungs, and can spread to other organs. The appearance of tuberculosis often reflects the destruction of a country’s infrastructure through political and economic instability, deteriorating health systems and health conditions and, ultimately, through poverty. Central Asia is one of the world’s ‘hottest spots’ for multi-drug-resistant tuberculosis. Nowhere is this more dramatic than in the former Soviet Union since the break-up of that nation in 1991. Within the former Soviet Union, nowhere is the appearance of tuberculosis more dramatic than the former Soviet republics in Central Asia of Kazakhstan, Kyrgyzstan, Tajikistan, Turkmenistan, and Uzbekistan. Within this region, nowhere has TB more dramatically appeared than in an area bordering the now-dried up Aral Sea in the autonomous republic of Karakalpakstan, Uzbekistan. HERE IS A MICROCOSM of all that goes wrong in a society: environmental, political, and economical. This instability leads to poverty, and poverty helps incubates the appearance of tuberculosis. 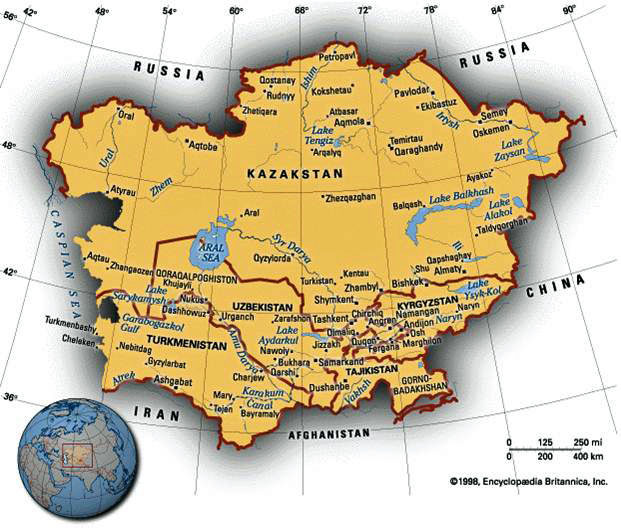 Its new ‘ground zero’ for infection is Karakalpakstan, Uzbekistan, where the multi-drug resistant (MDR) tuberculosis rate is one of the highest in the world. Given these prevailing conditions, it is imperative that funds, programs and training, and first-line drugs be available to keep this MDR-TB epidemic from exploding throughout Uzbekistan and beyond its borders to the rest of the world. Karakalpakstan, Uzbekistan border the Aral Sea. A SOVIET HISTORY LESSON: For thousands of years this northwestern area of Uzbekistan—known as Karakalpastan, the name of the ‘Black Hat’ nomadic tribe—was a prosperous, heavily populated oasis for fishing as well as a fertile delta for simple irrigation-based agriculture. Water came from two main rivers, Syr Darya and Amu Darya, which fed into the Aral Sea. At one time, this sea was the fourth-largest in the world, and one river—the Amu Darya—was wider than the Nile. However, in 1918 the Soviet government diverted water from the two rivers in massive projects to irrigate the desert for crops such as fruits, grains, and rice and—most importantly—for cotton as Uzbekistan’s top export. Over the years the Aral Sea began losing its water supply and gradually began drying up. Pesticides and fertilizers leeched into the water: as the water dried so did the salt and chemicals, spread by winds and dust storms. Additionally, for many years the Soviet government used an island in the Aral Sea to develop and test biological warfare – weapons-grade bacteria and viruses such as anthrax and bubonic plague—which contaminated the water, land, animals and vegetation. As the Aral Sea dried, that island transformed into a peninsula, making its contaminated area more accessible to humans and animals. Abandoned ship in Karakalpakstan, Uzbekistan. The seaport town of Muynak is now 93 miles from water. Against this environmental and political backdrop, the ‘desertification’ of the Aral Sea diminished to just 10% of its original size, leaving a wasteland of 19,000 square miles –about twice the size of Massachusetts. The once-thriving seaport of Muynak, Karakalpakstan is now 93 miles away from water. The salinity of the Aral Sea’s remaining water increased five-fold, killing off fish, the fishing industry, and most of the area’s natural vegetation. 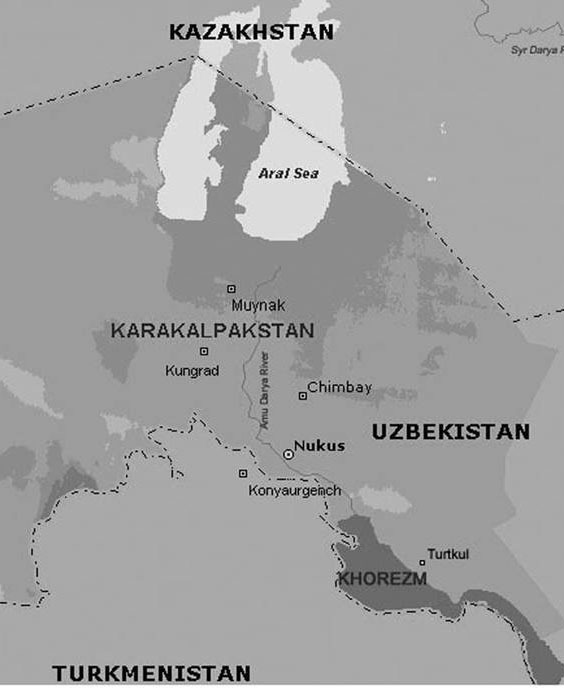 As the Aral Sea died, so did the region of Karakalpakstan, Uzbekistan. The United Nations calls this the ‘largest manmade environmental disaster in the world.’ It is, indeed, an environment ripe for disease. THE FALLOUT, UNENDING: This politically-based ecological disaster of the Aral Sea has many ramifications for health. After the break-up of the Soviet Union in 1991—and no longer supported with subsidies from Moscow–Uzbekistan plunged into poverty. Since fishing and related industries dried up with the sea, unemployment in Karakalpakstan has skyrocketed to over 70 percent. Those who do have jobs, such as health care workers, are poorly paid: about $12/month for nurses and $24 for doctors. Many have left the area, seeking more lucrative work. For those left behind and with money so tight they can’t afford to heat their homes, they crowd together into smaller places, creating unsanitary conditions. Moreover, with little money it is difficult to buy healthy food. If residents do have food, it may be contaminated from dirty water used in irrigation or from the soil itself. Additionally, salinized soil makes it nearly impossible to grow nutritious vegetables with essential micro-nutrients. Water is unsafe and contaminated with salts, DDT, and pesticides; diarrhea is widespread. High groundwater tables make sanitation inadequate. Anemia is high in women and children. Air-borne chemicals, salts and contaminated dust increase skin and lung diseases. 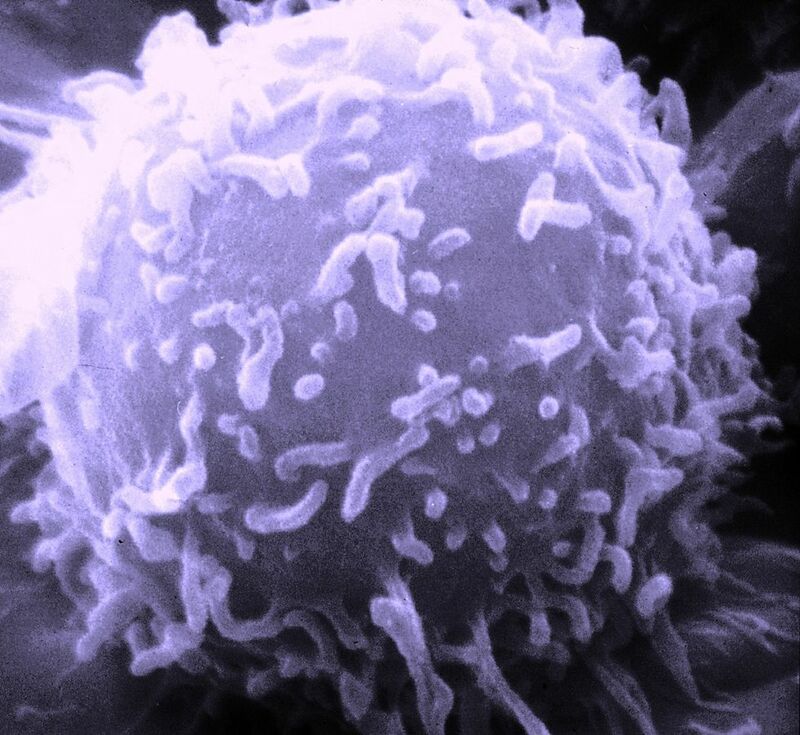 Throat cancer is the highest in the world–up to 80% of cancer patients in Karakalpakstan have this disease, which may be attributed to DNA damage. Contaminated air—especially in the capital of Nukus—is twice the international standard that is considered polluted. Karakalpakstan’s child mortality rate is the highest in all the former Soviet republics. GDP total spending on healthcare is just $6.50—low even by developing world standards such as Uzbekistan’s $177.12 By comparison, the United State is $6,700. Compare: Karakalpakstan: $6.50. Uzbekistan: $177.12. U.S.: $6,700.